This photograph of Comet West, one of the greatest comets of all-time, was taken by amateur astronomer John Laborde. The picture shows the two distinct tails. The thin blue ion tail is made up of gases, while the broad white tail is made up of tiny dust particles. Anasteroid cruising through the solar system six years ago seemed just anothersilent ship sailing in the eternal darkness, until it flared up with thestartling brightness of a comet's halo. Justlike that, the space rock known as NEO 2001 OG108 was re-classified as C/2001OG108 in 2002, from asteroid to comet. Scientists now suspect that 5 to 10percent of other Near Earth Objects (NEOs) may also be comets lurkingin disguise as asteroids. "Thatwas the first real evidence we have of objects that look like asteroids but arecomets in the NEO population," said Paul Abell, a planetary scientist withthe Planetary Science Institute who is located at NASA's Johnson Space Centerin Houston. Now he's heading a NASA-funded study to sort out which are which. Tellingapart comets and asteroids matters more than just to sticklers. Knowing thecomposition of NEOs is crucial to preventing possible collisions with Earth,especially when a collection of comet pieces bursting in the atmosphere canhave far deadlier consequences than an asteroid. Finding out about thematerials in comets and asteroids also provides hints about the early evolutionof the solar system. Abell'sresearch may even uncover future targets for spacecraft to investigate, similarto the Deep Impact and Stardustmissions. He is working with Faith Vilas, director of the Multiple MirrorTelescope Observatory at Mount Hopkins, Ariz., to try and identify suspectobjects for sure as comets or asteroids. Themost mysterious objects don't give up their secrets easily. Far-off cometbodies resemble dirty snowballs that lack the halo or "coma" they getonce they approach the warmth of the sun. As a result, such objects can appear"blacker than coal" to telescopes because they reflect just 3 percentof light that hits them, Abell told SPACE.com. Theformer NEO 2001 OG108 got as close to us as the orbit of Mars before acquiringits coma, which kept astronomers guessing up until then. Another object thatcontinues to arouse controversy is 3200 Phaethon, a suspected asteroid thatsome observers believe to be the husk of a burned-out comet. Theuncertainty goes to the heart of comet evolution. Scientists argue aboutwhether some comets simply lose their surrounding cloud of dust and gas, orform hardened shells to contain the loose icy material that makes up comets. Sofar, Abell has set his sights on three comet culprits in the crowd of spacerocks. NASA's Infrared Telescope Facility at Mauna Kea in Hawaii allows hisgroup to see the chemical composition of different objects, and even find theunique fingerprints of comets depending on their origins. Forinstance, some comets come from the Kuiper Belt, a disk-shaped icy cloud pastthe orbit of Neptune. 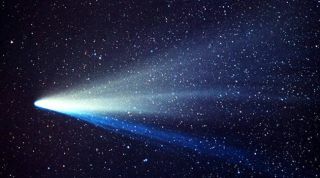 Other passing comets such as Halley'sComet start from much further away in the OortCloud, which lies far beyond Pluto's orbit at 1,000 times the distance fromthe sun to the Kuiper Belt. "Thereare some indications that there may be spectral differences between things thatcome from the Oort Cloud and things that come from the Kuiper belt," Abellnoted. Thesurvey has a long way to go after analyzing just three objects, Abell said, butthat's how science works. You get a result, and then you can start askingbetter questions.